Our partners at Effective Solution created QSalesData - the integration you are looking for. Having separate ACT! and Quickbooks databases can be a major source of inefficiency and redundant work. Take your business to the next level of efficiency. Link your ACT! 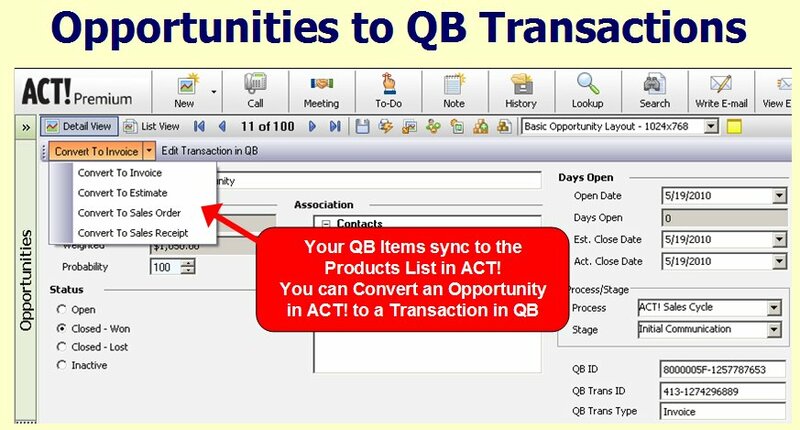 and Quickbooks applications together to eliminate double-entry and make your ACT! users more productive. Improved productivity. Less time rekeying data. Less chance of data errors. Improved Customer Experience. Obtain an up to date view of Quickbooks sales invoices and payment history for the person right from the ACT contact screen. Enhance Business Intelligence for better decision making. Know the customer's sales history and engage. Create Quickbooks Invoices, Estimates, Sales Orders from ACT! Sage 50 (formally Peachtree) Integration with ACT!